Anyone else having issues with svg and Firefox? Some things work, some don't. 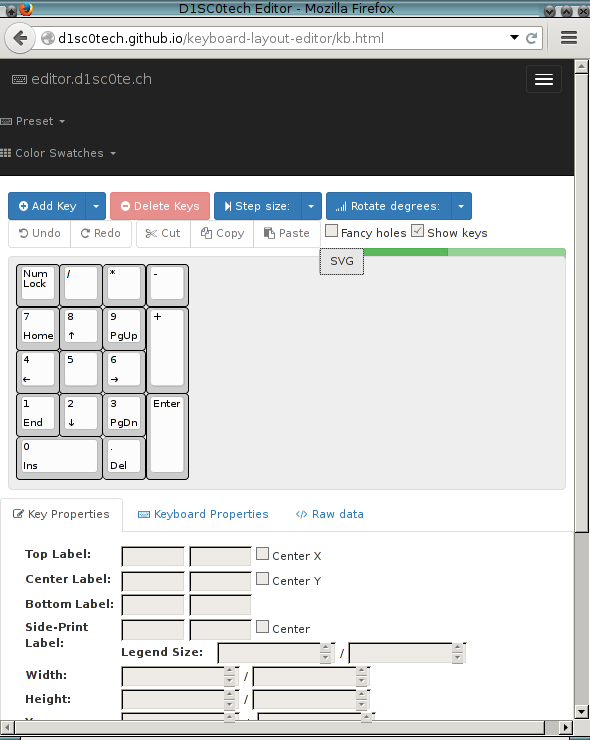 and click the SVG button on the right, it should generate a SVG of the keys. It works in Chrome. It works in Firefox on Linux Mint run via Virtalbox. It works in Firefox on Windows 7 run via Virtualbox. It does not work in my native Firefox, or even in Konqueror. I have svg switch in make.conf. Does anyone know why? I disabled AdBlock on that page. I installed firefox-bin, same problem. I also tried running firefox from the command line as root (to get a different profile), also does not work. Yeah, one would think that Google and Twiitter would stick to standards. The first two errors I saw relate to Google fonts and using Bootstrap, FontAwesome, etc. I think the W3C needs to update their validator for modern practices. Back to your OP, could you isolate a minimal test case showing what svg feature does not work in firefox? I have in fact downloaded modernizr and will see what it can tell me. So there is some SVG support. Perhaps it is a problem with the page itself then, but it's annoying that it will work in (an admittedly bare-bones) Firefox running on Mint in vitualbox, but not my own native Firefox. Perhaps some plugin is getting in the way. Have you tried with a clean profile ($ firefox -ProfileManager)? As above, tried as root from CommandLine, root has clean profile. (click on page to start animation). Alas it looks like it's probably a page issue, and unfortunately it looks like an svg implementation issue. What version of firefox does Mint use, and what version of firefox in win7? Are either using a svg plugin? Did not compare with any other browser, but firefox-31.7.0 (esr, non-bin) does toggle between show/hide of the keyboard view in that grey canvas when tapping the svg button. In case you were not familiar with firefox, you need to killall firefox && firefox -ProfileManager and create a new profile in order to get a clean one. Yes the behavior of 31.7 (esr, gentoo-stable) and 38.0.5 (latest, Windows XP) are different. Gentoo-stable blanks out the keyboard and 38.0.5-windows shows a skeleton. Unsure what the real picture should look like. Yosemite via Virtualbox: Firefox (new install, presume 38.0.5) works. Try installing 38.0.5 on Gentoo and see if it works. Based on all the version numbers that's reported, it seems likely that it was fixed in a later version of Firefox. Skeleton is correct ... it's supposed to be showing you the cutout you would need to make to build the keyboard. Am happy to report this works in 38.0.5 ... so will mark as solved. Curious that it worked in lower versions on Mint and Windoze though.. Thanks to all for all the suggestions. And what's different there compared to http://i.imgur.com/Ayyz3A8.png from my last posting? Apologies, did not check your image before, assumed it was showing the cutout but it does not appear to be. Here's two samples, the SVG still has at least one bug. Someone else wrote it a while back, probably didn't test on exotic designs. Images are wide, you may need to scroll right. True, and many more than one. But I think the problem here is with some of the js crap used in that site. You could try isolating the code snippet causing the problem and check which bug it is, eventually file a new bug.